Summer weekends and vacations are all about my family piling into the car and heading north to the cabin. These excursions always include one or more stops along the way for drinks, treats and bathroom breaks. These pit stops have also provided me the opportunity to become familiar with the local convenience stores and their genuinely unique product selections. Generally there isn’t much available in terms of nutritionally sound food at these sites, but there are clearly distinct food groups from which to choose: Beverages, grains (aka chips), candy, and protein snacks. It was in the protein group (which tends to take the form of jerky snacks) that a particular display and visual design system for Chef’s Cut Jerky caught my eye. In the “jerky” category there is great competition – national brands compete with regional and local brands, organic and gourmet products, sticks versus pieces, flavor variations and so on. It’s critical that brands quickly and easily define their product type and flavor. 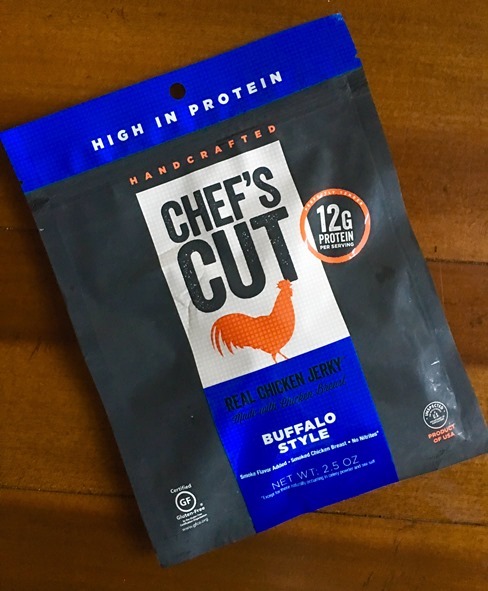 Chef’s Cut Jerky has done a great job of isolating and directing its brand focus, making it easy to quickly identify and make a product selection. Brand communication is distilled to a uniformly formatted central core on the package, leading with the Chef’s Cut logo. Strong saturated colors link to stylized animal icons and connect like proteins with secondary colors providing flavor/style cues. The brand core is then surrounded by a matte black field, which prevents the eye from wandering away from messaging and at the same separates the Chef’s Cut brand from adjoining competitive products. On a package with only two panels, p anel content becomes crucial. On Chef’s Cuts, the simplicity and clarity of the front panel continues onto the back panels with cookbook style photography beautifully representing content and preparation of content within the package. The visual story is supported by copy, nutrition facts and ingredient copy that reverses out of the black background while remaining remarkably legible. On each package a standard “testimonial” icon is copy and color cued back to the flavor and style of the jerky. The design and color system make the package bold, clean and masculine and at the same time uses clean, refined design elements to convey a message. mething really stands out from the visual agitation and catches your attention, it is worth taking a second look. I firmly believe effective packaging is packaging that after all the engineering, design and promotion are done, stands out from the competition and engages with the consumer first. From my vantage, this package design does an above average job of being front and center when the impulse calls.